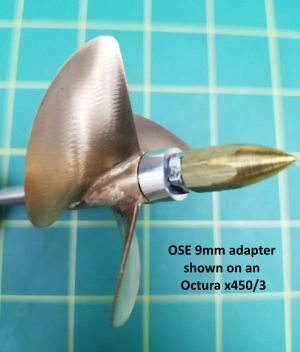 OSE Propeller spacer for 3/16 shafts. This is used to take up the space between a prop nut and the prop hub. 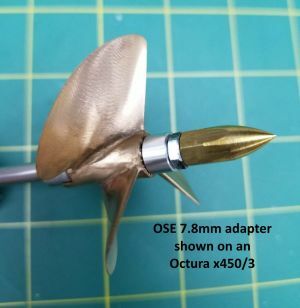 There are many times when the threads on the prop shaft are not long enough to properly tighten down the prop nut or a shaft is so long we don't want to spend an enormous amount of time threading the prop nut all the way to the prop. In the past the fix was to put a piece of fuel tubing in between to take up this space, which sometimes resulted in lost props. For $1.49 this solves this problem. Available in 7.8 or 9mm diameter. Silver anodized aluminum for corrosion resistance. Propeller, shaft and other items are for reference only. 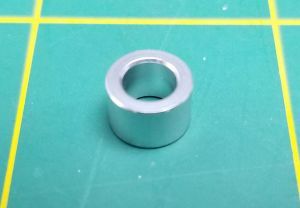 This item is only one aluminum spacer.